Commonly referred to as the Parrot Waxcap, this colourful mushroom appears in summer and autumn on roadside verges, in cropped grassland and in churchyards. Gliophorus psittacinus (syn. Hygrocybe psittacina) is an indicator of grassland quality, appearing on lawns only after years of low-nutrient management. 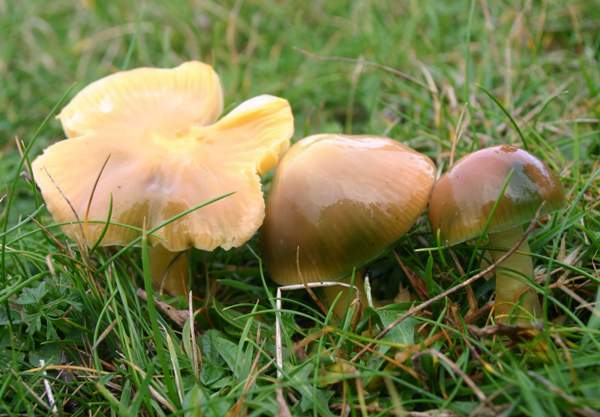 Two Parrot Waxcap species are recognised: Gliophorus psittacinus and Gliophorus perplexa; the latter was previously considered to be a mere variety and given the name Hygrocybe psittacina var. perplexa. Reappearing in the same places for many years the Parrot Waxcap is common but localised in Britain and Ireland. Because it favours unimproved acid or neutral grassland this distinctive waxcap is most plentiful in western Britain and particularly in Wales. Hygrocybe psittacina occurs across much of mainland Europe, where it is mainly a species of the cooler areas. Parrot Waxcaps are also found in many parts of North America. 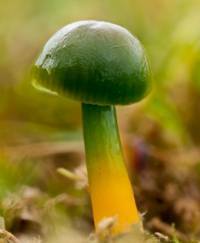 In 1762 the German mycologist Jacob Christian Schaeffer described the Parrot Waxcap, giving it the scientific (binomial) name Agaricus psittacinus. (Most of the gilled mushrooms were included initially in the genus Agaricus!) 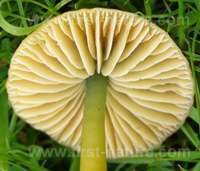 Its current scientific name was set in 1871 by another German mycologist, Paul Kummer, who transferred this species to the genus Hygrocybe. Synonyms of Gliophorus psittacinus include Hygrocybe psittacina var. psittacina, Agaricus psittacinus Schaeff., Hygrophorus psittacinus (Schaeff.) Fr., and Hygrocybe psittacina (Schaeff.) P. Kumm. 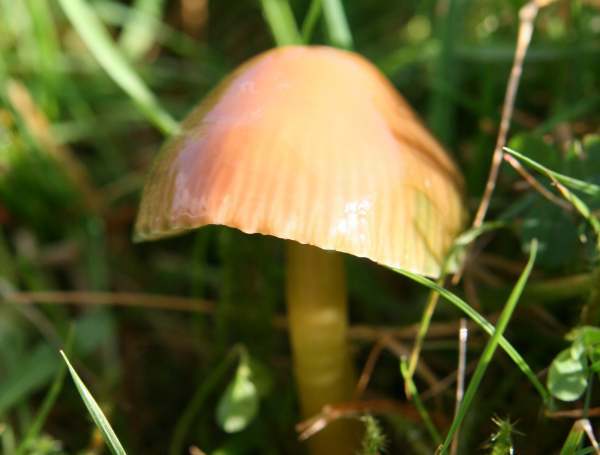 The autonomous form of Hygrocybe psittacina was formally recorded as Hygrocybe psittacina var. psittacina, because another variety, Hygrocybe psittacina var. perplexa was also recognised. In 1995, David Boertmann redefined the waxcap Hygrocybe perplexa (A.H. Sm. & Hesler) Arnolds as merely an orange variety of the Parrot Waxcap with no green colouring at the top of the stem - the specimen pictured above is probably, but not definitely, an example of this. It became accepted as Hygrocybe psittacina var. perplexa (A.H. Sm. & Hesler) Boertm. 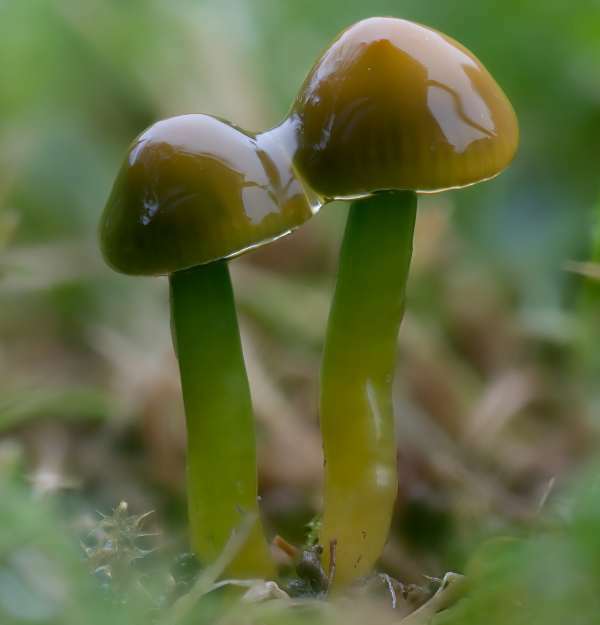 ; however, recent DNA studies have split of the Parrot Waxcap group from the Hygrocybe species and defined Gliophorus perplexus as a separate species. 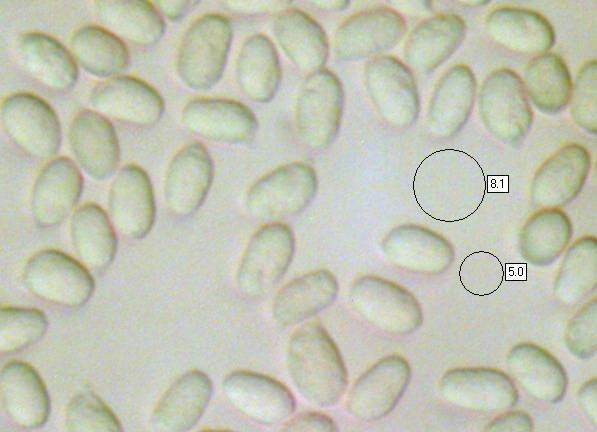 Synonyms of Gliophorus perplexus (A.H. Sm. & Hesler) Kovalenko include Hygrocybe psittacina var. perplexa, Hygrophorus perplexus A.H. Sm. & Hesler, and Hygrocybe perplexa (A.H. Sm. & Hesler) Arnolds. I plan to create a separate page for this waxcap species when time permits. Working out the origin of the specific epithet psittacina is difficult unless you are good at either Latin or Greek. The Greek word for a parrot is psittakos, while the Latin word psittacinus also means parrot. The common name hardly needs explanation: these lovely little fungi are often every bit as colourful as parrots. 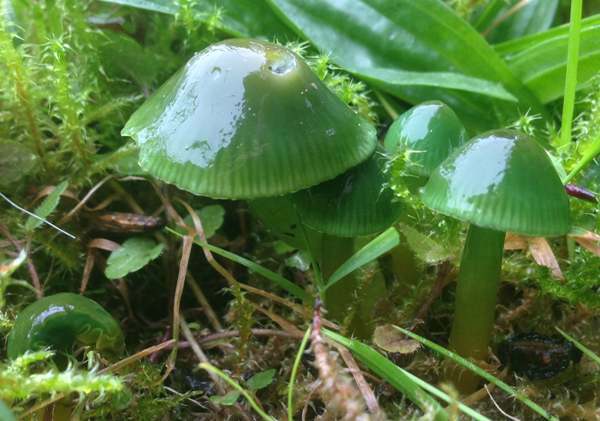 With either orange, yellow, brown, purple or green as the dominant colour of their caps, you might expect Parrot Waxcaps to be difficult to identify, but there is something about this species that makes it one of the easiest of Hygrocybe species to pin down. Initially green with shades of yellow, orange or purple, the bell-shaped cap expands, often becoming slightly umbonate, and it turns more yellow, sometimes retaining an orange or purplish tinge as the green slime washes off the cap. 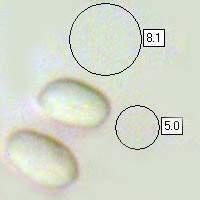 Cap diameter at maturity is 2 to 4cm. The thick, waxy gills are distant and have adnexed (very narrow) attachment to the stipe. At first green near the stipe and yellow towards the edge of the cap, as the fruitbody matures most of the green colour in the gills fades. Slender and usually straight; green near the cap and often gradually becoming more yellow below; solid, with pale flesh. 4 to 8mm diameter and 4 to 6cm tall. Ellipsoidal to ovoid or amigdaliform, smooth, 7.5-9.5 x 4-6µm, with a large apical pore; inamyloid. Cropped grassland that has not been subject to artificial fertiliser treatment for the past 30 years or more; also woodland clearings and shady roadside verges. August to November or early December in Britain and Ireland. 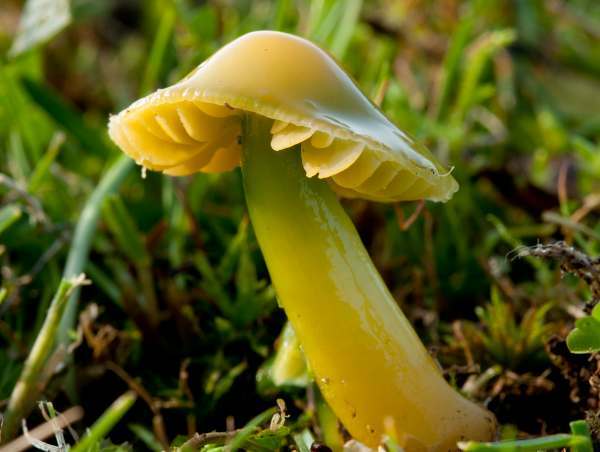 Hygrocybe chlorophana is an all-yellow waxcap of similar size, but it does not have the initial green colouration and it has a hollow stipe at maturity. On a Europe-wide scale waxcap fungi are now quite rare, and so although in western Britain many of the acid-soil species are still plentiful most mycologists deplore the suggestion of these lovely fungi being gathered to eat. In any case most waxcaps are insubstantial and it is uncertain whether they are safe to eat. Some authorities list the Parrot Waxcap as edible, but others state that it is inedible; however, these colourful wild mushrooms have a built-in protection mechanism: they are slimy enough to put most people off the idea of eating them. This page includes pictures kindly contributed by Simon Harding and David Kelly..